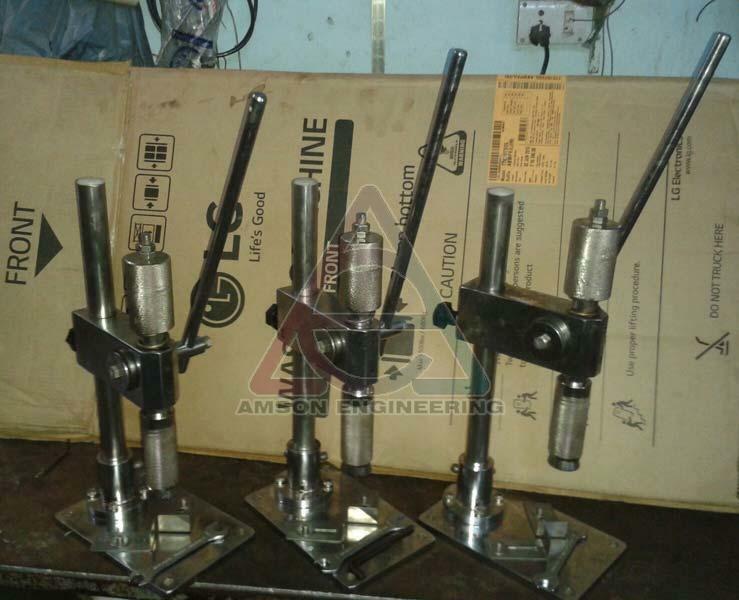 Fostered with rich industry experience and a highly experienced team of professionals, we as a leading Manufacturer, Exporter & Supplier are offering Manual Perfume Bottle Crimping Machine. It is manufactured using optimum quality material and sophisticated technology in adherence with industry standard. It is inspected by quality controllers on diverse parameters so as to ensure the flawlessness of our range. Our esteemed customers can avail it at market leading prices. Hand operated Perfume pump crimping machine is widely used in Perfume industry, to fix pumps on filled glass bottles. This machine is useful where small and medium scale production is required. Where there is more production required, and if it is more human labour available, then also this machine is suitable. Machine type is Manual operated and it is made from cast iron, Mild steel material, and hard steel, finished with chrome plating. Powder coated models also available. Machine consists of a Base Plate, Pillar structure which holds the Crimping Head with adjustable mechanism, and operating lever. There is a spring loaded bottle resting platform is also provided on the base plate. The height of machine can be varied as per the bottle height by unlocking the lever at the back side of the unit and move up or down as per required. The Crimping Head is having a Collet at the inner side, and an operating lever at the top side. When the lever is pressed downwards, the collet shrinks towards the centre and crimping is done. The collet is also having adjustment screw at the inside to adjust as per the pump height. This machine is very simple to operate. Bottle with pump, to be crimped has to be placed under the crimping tool over the platform. Make sure that the pump is inserted well into the tool and clamped to the bottle neck. For this, the spring loaded platform can be pressed down with your hand, while placing the bottle. Now release the bottle so that it is clamped perfectly to the collet. The hand operating lever is to be pressed downwards , in order to press the tool over the pump to the bottle neck. This causes the perfect crimping of pumps to the bottle. Height of crimping head according to the height of Bottle can be adjusted by loosening the back lever and slide the head over the pillar upwards or downwards. Any bottle sizes can be crimped with this machine from 13mm to 20mm by changing the collet. Different sizes of Collet (tool) available with us as per your requirement. Adjustments for collet inside depth with a screw provided as per variations in height of pumps. Hardened tool material assures long life for the machine. Inner stopper for the pump made from Stainless steel material. Heavy structure ensures good quality crimping. Long operating lever gives smooth working. Compact design and less weight, so that the machine can be carry by hands. Number of Collets - 1, Single Head. Can Crimp Perfume Bottles and other similar bottles. Output - 20-25 crimped bottles per minute depend upon labour skill. Crimp Tightness adjustable by set screw inside the collet(tool) by ALLEN KEY. Machine weight - 13 kgs. Parcel weight - 16 kgs.